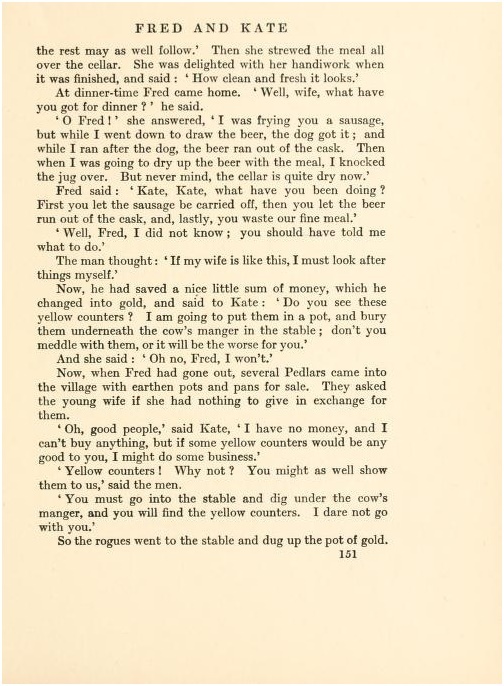 Here's my favorite little known story by the Brothers Grimm, but along the way I want to give the story of both how I use it and how I came to put it in the "Keeping the Public in Public Domain"series. Right before the Frankenmuth Historical Museum had a lecture on the Grimm Brothers, I happened to see their exhibit. There wasn't time to post an announcement here before the lecture, but the exhibit will be there until Halloween. (I asked about that interesting ending date and was told it was when they would open a new exhibit about the SS Edmund Fitzgerald, which sank in 1975.) Frankenmuth is a major Michigan tourist site and always offers events, shopping, and dining, so it's worth the trip even without the lecture. The exhibit is well done even for those of us well informed about Grimm tales beyond the usual Disney versions. (There's an adults only cabinet with the original tales to explore.) To see the exhibit you need a museum ticket and it may help to know the exhibit is at the end of all their displays. If you want to see well done exhibits about Frankenmuth from pioneer times and on throughout its history, follow the normal entrance to the right of the shop. If you are in a rush, want to walk less, or don't care about those historical exhibits, it might help to know the same ticket could let you see just "Fairy Tales from the Brothers Grimm" by entering to the left where the exhibit hall ends. With so much happening in Frankenmuth, that also is a reasonable choice letting you see biographical, illustrative, and comparative Grimm displays, as well as some geared to any children accompanying you. 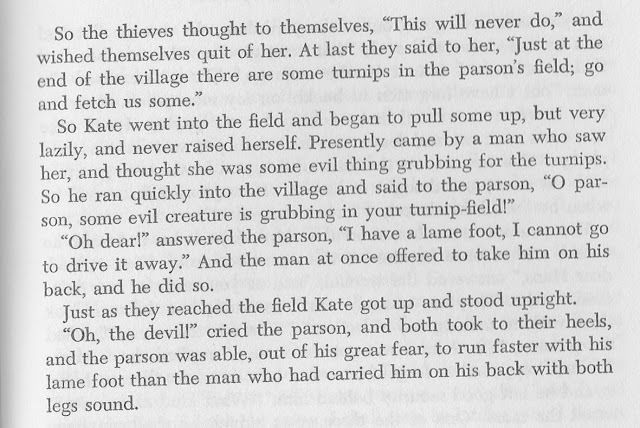 Today's story as I tell it is less than I discovered prowling various Grimm editions and finding public domain copies. HORRORS! Have I sanitized Grimm!?! Not really. It's just the story is often published without the final adventure. It's also politically incorrect and I love it! There's a story type called "Noodleheads" where the main character is hopelessly unaware of the crazy, yes, dumb results of actions. The female version is the stereotypical "dumb blonde", but the sheer zaniness of any Noodlehead has a bouncy lack of awareness. When I tell it, I rename the main characters "Friedrich and Katya." 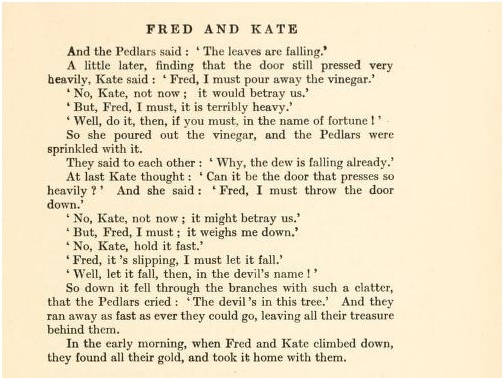 This feels more in keeping with their Germanic roots than the title of "Fred and Kate" given by Mrs. E. V. Lucas whose version appears here. 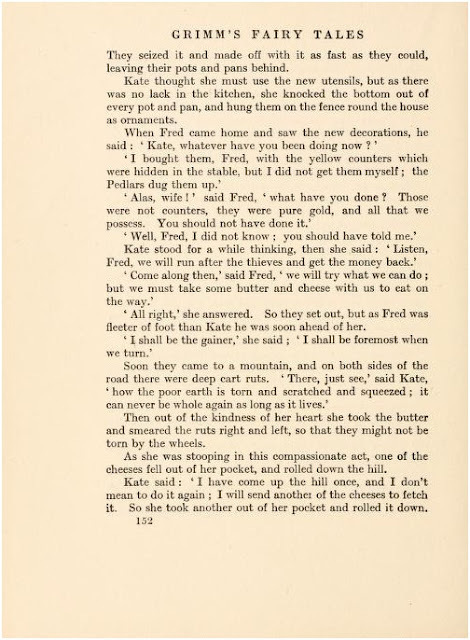 Some versions title it "Frederick and Catherine." Anytime you use a translated tale, title variations can play havoc with finding the story. My Katya always earnestly answers her newly wed husband with "I did not know; you should have told me what to do" and from her viewpoint it's true even as he tries to goofproof their recent marriage. Now for the part that probably only appeals to researchers. 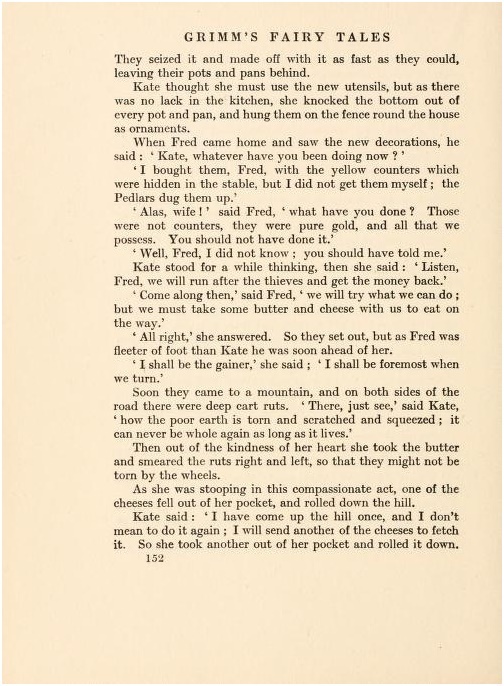 The version I will start with is from Mrs. E. V. Lucas, but, just as her husband is the one noticed in the early 20th century, I found her translation work also almost uncredited in more than one edition. 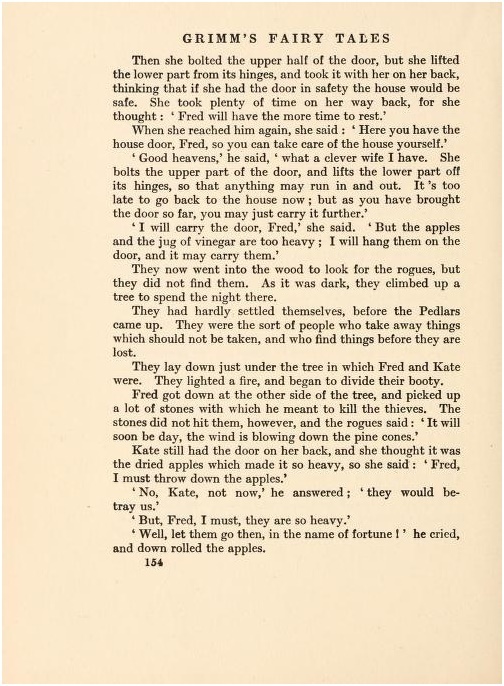 There's the undated Lippincott book, Fairy Tales, illustrated by Arthur Rackham, but clearly predating the 1915 Index to Fairy Tales, Myths and Legends by Mary Huse Eastman. There's also this copy found in the Internet Archive edition which has a 1920 publication by E.P. 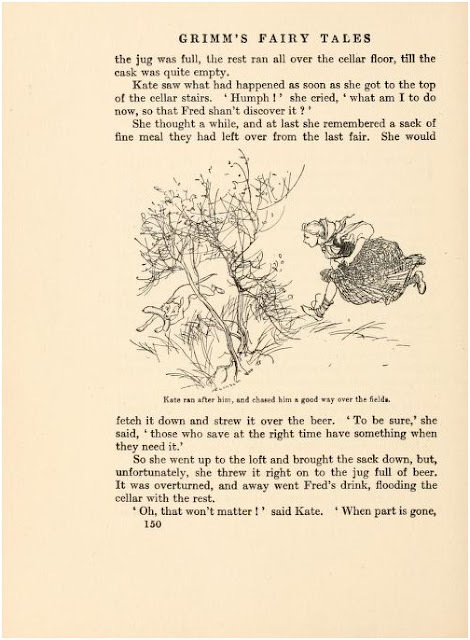 Dutton crediting an earlier version from 1909 of "Grimm's Fairy Tales illustrated by Arthur Rackham" but omitting the translator. 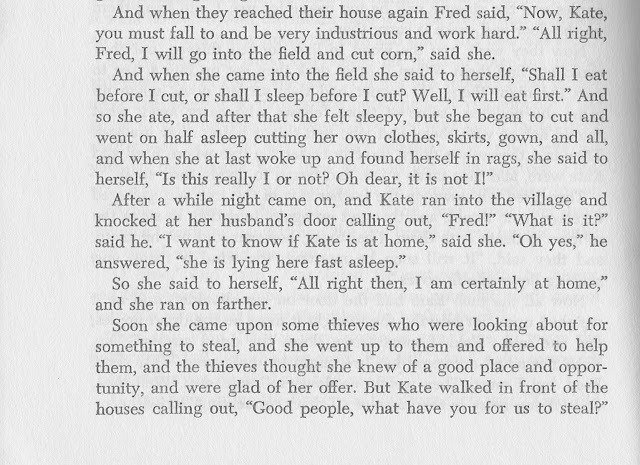 by the brothers Grimm. 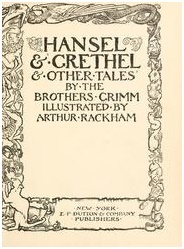 Illustrated by Arthur Rackham. 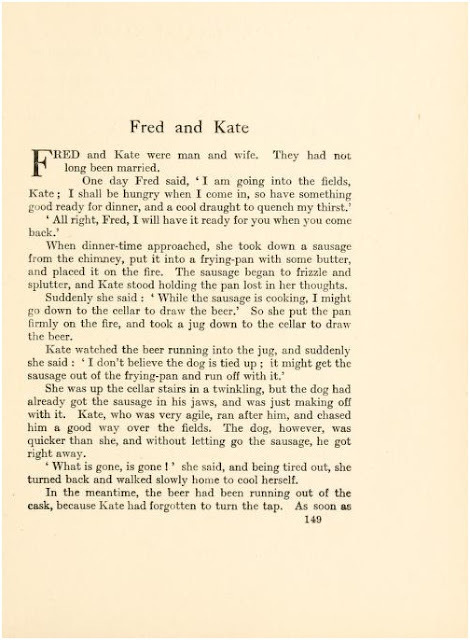 Published 1920 by Constable & Co. in New York . Translated by Mrs. Edgar Lucas. That's where I've been ending the story. Here's the rest of the tale from the translation by Lucy Crane, truly an interesting 19th century woman. 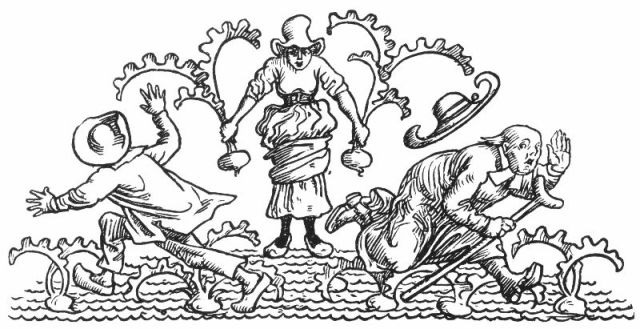 Oh and about that header on this article by Walter Crane, he's her more famous brother. I don't care for her version before this as much as the translation by Mrs. Lucas, but think it's time to give "the rest of the story" to you. I'm not sure if I will add it when I tell the story. The story picks up where we stopped by jumping into her Household Stories published by Macmillan in 1899 and ends with another illustration by Walter Crane. Hmmmmm. What do you think about the story? What about the extra adventure? An earlier post in 2012 about the Grimm Brothers bicentennial's Project Grimm points out the KHM number of this story is 59. 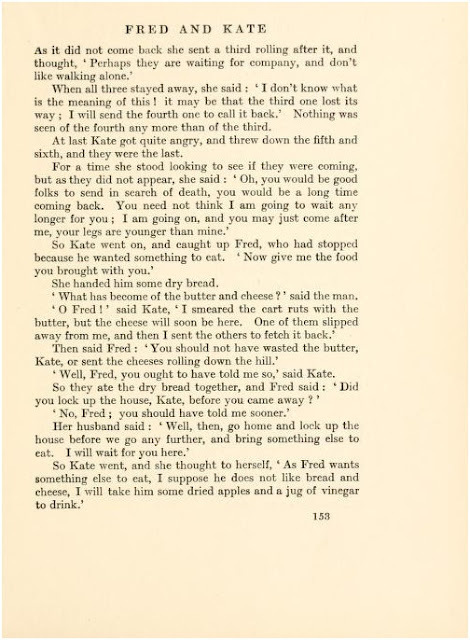 Wikipedia's summary of Frederick and Catherine includes the final adventure and also notes it combines eight Aarne-Thompson types. That number certainly may help you more than the way publishers repackage versions of the story and then copyright the total book for something like different illustrations. One of the books I have with this story did exactly that. It never stated if their version came from Lucas, Crane, or a third interpreter who never included this little known story in her collection of stories by the Grimm Brothers. They count on you thinking the story itself is under copyright. 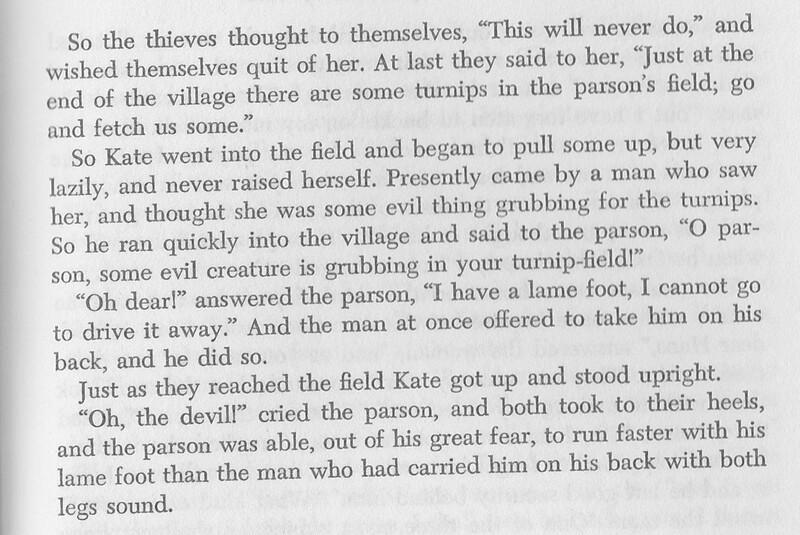 This is a perfect example of a story told in many translations, but still worth Keeping the Public in Public Domain.